Hi Everyone – Just a quick short note here. 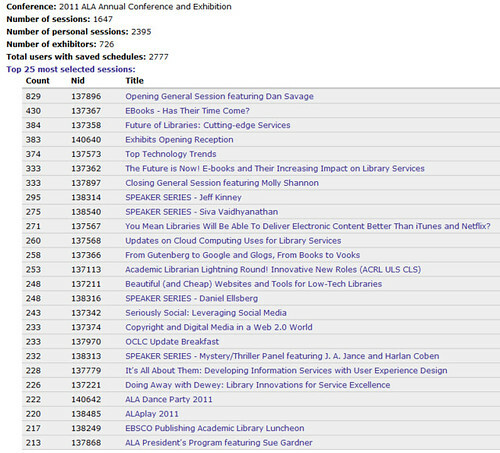 We’re very excited to be a part of reshaping ALA, as you can probably tell from some of our recent posts. The first step is getting involved, which we will be kicking off this weekend at the annual conference. Annie, Lauren and Micah will be attending the conference (and wishing everyone else could make it too! ), and feeling out the pulse of our profession – Annie as an MLIS student and Lauren and Micah as n00brarians. Aside from the great sessions and speakers, we are excited to get out and meet folks, friends, readers, peers and leaders in the field. There are plans(?) to try to do some short posts from the conference, although we’ll see if/how that actually pans out. Micah will be wandering around collecting sound bites for the ever-popular Two Minute Insights that we sorta gave up on, but are hoping to revive. We have applied to iTunes for our podcast license, and for now you can listen to the past TMI’s below. Keep an eye on our Twitter and Facebook page for new TMI’s from the conference. Thank you again for reading and supporting us, and please, do come up and introduce yourself. We’re shy too. Hope some of you will make it to the HackLibSchool Meetup at Avenue Pub, Sunday night at 8:30ish! Have fun!!! Can’t wait to hear/read about your adventures in hacking #ala11!! Hey Micah, it was great meeting you yesterday at the ALASC Leadership meeting. I found your chart above fascinating. Especially since I tried getting into the E-books session, and at the time it started, they were not letting any more people into the session because it was too full. It was very frustrating trying to hear from the hallway… Based on the chart above, ALA knew it was going to be extremely popular (#2), and thus, should have had a larger room to accomodate more people.